Roma welcomes Napoli in a very intriguing clash from the 29th round of the Italian Serie A. Let’s take a look at this fixture at the Stadio Olimpico in the Italian capital. Roma are currently 5th in the Serie A standings, remaining in the fight for a Top 4 finish and a Champions League qualification. Right now they have 47 points won and a record of 13 wins, 8 draws and 7 defeats. Right now the Wolves are 4 points behind the 4th Milan, so surely they need some points now. Roma are inconsistent this season, which led to the sacking of the manager Eusebio Di Francesco. He was replaced by the experienced tactician Claudio Ranieri. In the previous round Ranieri suffered his first defeat since his arrival, losing with 1-2 the visit to SPAL. Diego Perotti scored for Roma from a penalty kick, but it was not enough for the visitors. 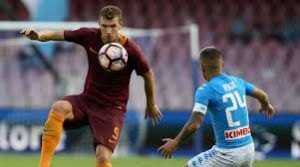 For Roma it was very dissapointing to lose against SPAL in a such a decisive phase of the season. Meanwhile Napoli are 2nd in the Serie A with 60 points. Most likely the Azzurri will finish the season in this position. They can be pretty calm that they will play in the Champions League again next season, being 13 points ahead of the 5th Roma in the standings. Of course, it doesn’t mean that Napoli will just hand the win to Roma on Sunday. Most surely Carlo Ancelotti’s boys will show their best at the Olimpico, which will make things very difficult for the Wolves. Napoli are arguably the second best team in the country after Juventus. In their last game Napoli enjoyed a 4-2 win against Udinese at the San Paolo. Amin Younes, Jose Callejon, Arkadiusz Milik and Dries Mertens scored for the home side. The clash between Roma and Napoli in the Serie A shall be pretty exciting to watch. We wish you good luck!